The LaVida Waterfront Relaxed Lifestyle is a must stay property for your next holiday. This beautiful property is North To Water, Single level with a Sub Tropical influence. No need to go to Bali as this relaxed setting will make you feel like you are there. This immaculate stylish single level home is situated in a popular tree lined street, with under cover parking, in a good central location with a large park at the end of the street. The property offers a large parents master bedroom with ensuite, 3 other spacious bedrooms and a kids dvd/play area equipped with DVD's to keep them entertained. There is bedding for 10 guests and there is also tow rollaway beds which would suit small children if required. Beautifully set out with open plan living with opening doors to allow free-flow from inside to the outdoor covered entertaining area. Great outdoor entertaining areas, fully glassed fenced pool overlooking the waterfront and sandy beach. Built in BBQ area with alfresco dining. 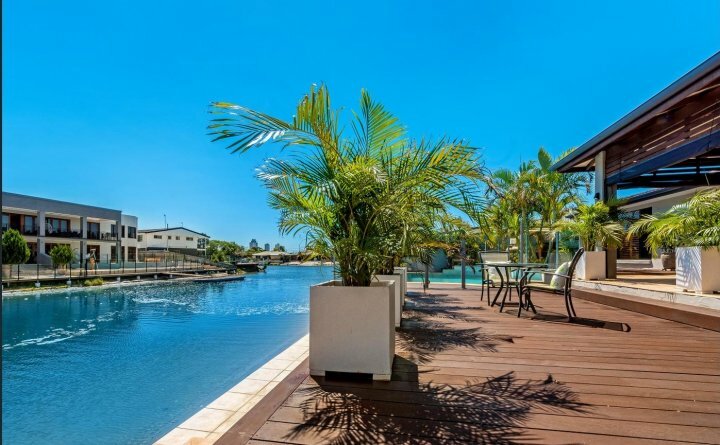 This Superb laid-back waterfront property offers the peace & quiet to enjoy your stay - yet is easy walking distance from everything Broadbeach has to offer - Broadbeach is well known as the best location to holiday on the Gold Coast. With the fantastic restaurants and cafes, shopping, nightlife, Casino, Convention centre, Pacific Fair shopping centre, Golf courses and of course our beautiful beaches are all close by which makes the perfect holiday destination. Theme Parks are about 20 minute drive and Coolangatta airport is around 30 minute drive. Come and relax here and enjoy our great waterfront location you wont be disappointed. Nightly rate for 3 night stay. Nightly rate for 4 night stay. Nightly rate for 6 night stay. Nightly rate for 7 night stay.